The Christian gospel continues to be proclaimed today, as it has been continuously for many centuries in our magnificent parish church. It is said that many of the visitors who enter the church remark similarly “how light and welcoming the church is and how well cared for”. This perhaps reflects the pride the people of Northleach have in this most important and historic building. For it was not always as light, and richly endowed as it is now. Part of the church dates back to at least the 12th century; but it was the wealth of the local wool merchants in the 15th century that transformed it into the architectural gem that we now have the privilege to enjoy. 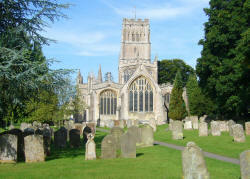 The story of Northleach Church is contained within the building itself, as each of its many fine features has a tale to tell. The Church as we know it dates from the early 12th century, and was built on top on an even earlier building, also believed to have been a church. The 12th-century version of Northleach Church was a fairly simple one, basically consisting of the aisle and not much else. That the chancels were a later addition is immediately apparent from the South Eastern ‘quoins’ visible in the ‘Bicknell’ Chapel. Other things changed too, and we know from the scar on the steeply pitched roof of the tower wall that the south aisle was widened twice. The chancel was built in the 1300s, followed by the nave, aisles and sacristy in the 1400s. The overall style of the present church is known as the late medieval “glass cage” type in which the structure of the church is of less importance than the large, traceried stained-glass windows. As you walk around the church you will see groups of memorial brasses on the floor. These nearly all depict rich wool merchants and their wives. At their feet you can see sheep and woolpacks, along with the merchants’ woolmarks. Guide books giving a detailed description of the church and the brasses are available inside the porch. On the left of the porch as you enter are two carvings. The first is a pig’s head, the second a cat playing the fiddle with three dancing rats. These are thinly-veiled references to the old rhyme “The rat, the cat and Lovell the dog, ruled all England under the hog”, written by William Collingham, which satirises the relationship between Catesby (the ‘cat’) Leader of the House of Commons and the King’s favourite, Ratcliff and Lovell (The ‘rat’ and ‘dog’) important land owners, and the King himself (The ‘hog’) whose emblem was the wild boar. The verse cost the impertinent poet his life. On the ceiling of the porch, to the left, are four beautiful corbels showing carved heads. They are pre-reformation, and were lucky to escape the reformist’s attention. Once inside the Church, turn left. A small wooden door marks the entrance to what used to be the priest’s living quarters and still contains a fireplace, bread oven, candle brackets and cupboards. The flue cunningly emerges from one of the pinnacles. The room, situated directly above the porch, was later used as a school room – in fact there is graffiti left there by schoolboys from 1640 onwards! The main feature of this area (known as the South Aisle) is the magnificent covered font, dating from the1300s, although the cover is, unfortunately, a more modern replacement. The carved stone font is believed to be the handiwork of an East Anglian craftsman, and depicts a variety of scenes. At the top of the font are six carved heads, with wavy hair and drooping eyelids. Lower down the pedestal are eight angels playing early musical instruments: viols, tabers, flutes and nakers. At the base are demon heads being squashed out by the holy water! Moving in a clockwise direction around the church, we come to the tower. The tower is 100-feet high, with diagonal buttresses at the lower corners. It is crowned with panelled battlements. From the design it appears that a wooden spire was to have been added, but as far as we know was never erected. Originally the tower had a balcony, removed in 1884. If you look up at the ceiling of the tower you will see it is stone vaulted with a central opening through which the building materials were raised to the two top chambers by the use of ‘sheer legs’. In the early days, bell ringing was a simple affair with few bells, but in 1700 six new bells were hung, and a further two bells added in 1897 in honour of Queen Victoria’s Jubilee. We now have an eight-bell carillon, which strikes every quarter of an hour and on the hour at three, six, nine and twelve o’clock both day and night, playing three versed of ‘Oh worship the King’ to the tune of Hanover. We then progress to the North Aisle, consisting of the organ, choir stalls, pulpit and the North East Chapel. The roof that covers them is original mid-15th century, and still shows original coloured and gilded shields. In the early part of the century a barrel organ was installed in the front of the gallery but it was later removed and replaced by a small pipe organ. The present organ was installed in 1884, and placed in its present position halfway down the North Aisle, to be closer to the congregation. The very fine 15th century stone pulpit is called a ‘goblet’ type due to its shape. It is one of less than 60 pre-reformation stone pulpits left in the country. Just before the North East Chapel, you can see a staircase in the wall. It appears to go nowhere. Often seen in churches of this period, the staircase originally connected to a balcony running the width of the church, from the steps straight across to the Lady Chapel. This balcony, the ‘Rood Loft’ (rood being the old English word for Cross) supported the rood screen. It divided the east, or holy part of the Church, from the west part ( the Nave – the town’s meeting place). Unfortunately, during Elizabeth I’s reign, laws ordered them to be removed and broken up. Enforcement varied from diocese to diocese but Gloucester rigidly executed the law, and thus no traces of the rood loft, save the steps, exist. Pass through the North East Chapel, (of a later construction, and hence the more delicate arch and column). We now come to the Chancel, the main focus of the Church. It is divided into two parts, with the holiest and most ancient part dating from the 14th century. The high altar, the top of which is a single stone slab or ‘mensa’ is ten feet long and weighs a ton. During the reformation, stone altars had to be removed and wooden Communion tables installed in their place. Fortunately, our town people buried the stone under the chancel floor, ensuring its preservation, but it was not found again until 1874. On the right of the altar is a fine cedilla or priest’s seat added late in the 15th century. Behind the altar, the East window can be seen. Unlike most of the other windows in the church, which date from the 15th century, it is modern and was designed by Chris Web in 1963. It shows the risen Christ with St.Peter and St.Paul on either side of Him. Before moving on to the Lady Chapel, there is an interesting feature to note. If you look at the pillar separating the chancel from the lady Chapel, you will see two oblong holes. These are ‘squints’ or in Greek ‘hagioscopes’. They were designed so that in pre-reformation days (when the Church was, of course, a Roman Catholic Church) the assistant priest in the Lady Chapel could see the priest in charge at the high altar. This would allow the priest and his assistant to synchronise the raising of the bread and wine at the moment of consecration. On to the Lady Chapel itself, also known as the Bicknell Chapel after its 15th century benefactors. If you look on one of the corbels, it shows the date the Bicknell family built the chapel in 1489. It is difficult to read as the four is an arabic numeral, resembling the modern four turned through 45 degrees, which was then beginning to replace the roman numerals. The Nave is the most impressive section of the church. The tall concave peers are unusual, and the clerestory windows give much light, especially the large window over the chancel arch-known as the Cotswold window. John Fortey, church benefactor and woolman, enlarged the nave in 1430.The work was carried out by his relative Thomas Fortey. Between them they added two aisles and replaced the nave walls with the magnificent arcades. They then raised the roof and inserted the clerestory. Originally there would have been no seating in the nave. In the 15th century, pews were installed, and again the pews were replaced with box stalls in 1814. In 1884, these in turn were removed and rush seats were installed at the same time as the new centre altar screen and rail, which were designed in 1964 by Sir Basil Spence, the architect of Coventry Cathedral, which had been destroyed during World War II. All the new interior woodwork was constructed by the local firm of craftsmen – Gordon Russell of Broadway.